The Type-2 is the standard antipersonnel fragmentation grenade of the Covenant heavy infantry. It resembles the early 20th century Model 24 Stielhandgranate superficially, which has lead to it being called “potato masher”. It has also acquired the monikers “spike grenade”, “table leg”, and “nail bomb”. The directional explosive characteristics of the Type-2 makes it particularly suited to defensive and antivehicle use. ¹ The explosive force and fragment distribution of the type-2 APFG is channeled into a narrow cone perpendicular to the surface it strikes. The mechanism by which the explosion of the type-2 is directed is similar to that of the M383C Linear Shaped Charge Demolition Kit. In the UNSC’s limited encounters with the spike grenade, we have learned much of its tactical applications both through contact with the Brutes and field tests of our own using discarded equipment. The quills of the spike grenade seem to be able to grip almost any surface upon which it’s been tested. This includes rock, glass and even some Covenant shield systems, unlike the plasma grenades which we have encountered before. The other feature unique to this grenade is its directional blast. Our researchers have discovered that the directional blast of the grenade is not designed to come out of one end or the other, but instead is relative to the surface against which it rests. If thrown against a perfectly flat wall, the grenade’s blast will disperse perpendicular to the wall. The Brutes have proven the strategic advantage of the grenade time and again in their recent activities on Earth. In the type of street to street urban combat we’ve been forced to participate in, and the close quarters therein, the Brute grenade is a ferocious problem. Its most useful application thus far has been to throw it directly across from an enemy, or rather where an enemy will be. 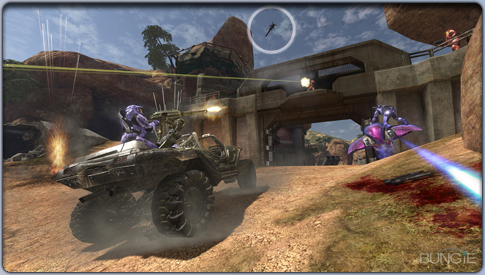 The blast is typically enough to kill a marine or grunt but conversely, it will heavily damage a Brute. Applying the grenade directly to an enemy will invariably result in death. While the initial wound, akin to being run through by mini-baseball bat with nails sticking out of it, is survivable, the device arms upon impact and invariably detonates before it can be extracted from the body. The application of the spike grenade will at first come naturally to UNSC forces that have experience with the plasma grenade and its capacity to stick to the enemy. This element of its feature set will not take much getting used to. The main difference between the spike grenade’s sticking ability and the plasma grenade’s is the fact that the spike grenade will still maintain its directional blast as opposed to the plasma grenade’s spherical blast. If you stick an enemy with the spike grenade you will want to get away from the blast as quickly as possible. Spartans have made a habit of sticking the enemy and then jumping straight over them to avoid the blast. Our more tactful marines will stick a brute and immediately find cover. If you have multiple targets, it may be advantageous to stick the rearmost of them and let the blast claim the targets in front of it, meanwhile shielding you from the blast. There are many scenarios in which the spike grenade can be used more like a claymore mine than the grenade designation we’ve given it. The base at High Ground presents several such opportunities for the defending force. The many flat surfaces and 90 degree agles make it an ideal environment in which to set up a trap for an approaching opponent. One can, for example, use the corridors of the base to trap opponents in the line of the spike grenade’s fire. Two such corridors leading in through the bunker are quite narrow and throwing a spike grenade onto the wall as an enemy passes, can be just as effective as placing a frag grenade right at their feet. It’s better than tossing a frag however, because you don’t need to calculate for the bounce - and better than a plasma because you don’t need to be precise enough to hit a moving target. It is certainly a weapon benefitting the smarter and more patient soldier willing to wait for the right moment to strike. Another of the spike grenade’s claymore-like features is its ability to cover an individual’s retreat. When falling back to better cover in the battlefield, soldiers can toss the spike grenade at passing walls and objects in order to slow the advance of pursuing foes. This can apply to any area but one specific scenario in which it has been particularly useful has been in the Covenant facility at Snowbound. The shield doors that are riddled throughout the base do not permit active projectiles or armed grenades to pass through them, and therefore the spike grenade sticks to this as it would any other surface. Our soldiers have found this particularly useful in enemy encounters, as they stick a spike grenade to the door, pass through and then turn around to watch the spike grenade take its toll on the following enemy.